When a farmer grows crops, much time and tender loving care are required to ensure a successful harvest. When you meet with potential customers, it is unreasonable to expect that they are going to stop going to the competition and move to your firm. Prospects who have specific needs that are not being met are like low hanging fruit — they are ripe for picking. But what about the other prospects that decided not to buy from your firm but are still potential customers? Perhaps they are not ready to leave one of your competitors yet. But at some future date, they may be willing to do business with another company. How do you ensure that your name is at the top of the list of alternatives? Existing clientele also require nurturing. Most companies find time to stay close to their top customers. It is more difficult to devote extensive time to smaller profitable customers that you definitely want to keep. A solution to these dilemmas is to establish a “trickle marketing” campaign for your customers and prospects. This involves sending regular material to maintain a presence. In some cases, this material doesn’t have to be overtly promotional – it can merely educate customers with useful information and demonstrate your professional competence. By doing so, it keeps your company in the minds of prospects and customers. You are nurturing the relationship the way the farmer cultivates fruit. Many businesses send newsletters, tips, article reprints, news releases or brochures to their targeted audience. These devices are all useful. The problem is that most companies don’t send this material out frequently enough. Think of your personal response to direct mail. In many cases you pitch it in the trash without opening it, especially if you are busy. The pieces you open and notice are probably the ones that were sent multiple times. There is so much mail clutter that it can take dozens of exposures for your material to gain recognition. For the typical company this poses a dilemma. The high cost of printing and mailing marketing material can make repetitive contacts too costly. As a result, your customers and prospects are not getting sufficient touches throughout the year. Solution: Augment your mailings with an e-mail marketing campaign. 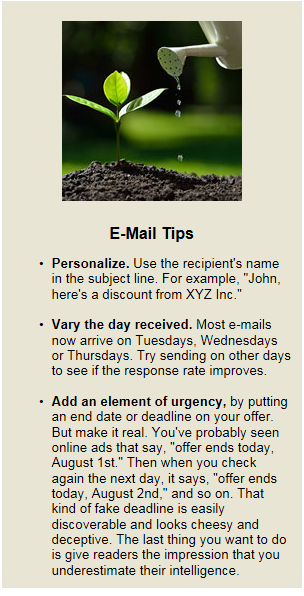 The costs are significantly lower when you send your material out via e-mail (see right-hand box for e-mail tips). The key to staying in front of customers and developing prospects is frequency and value. Instituting a trickle marketing campaign for your company can help achieve these goals.